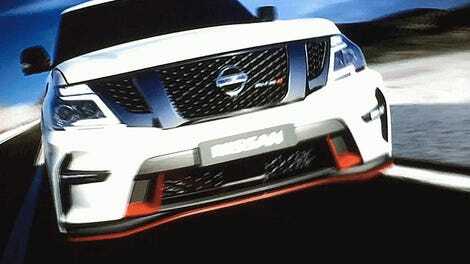 And that’s even though Nissan totally wimped out on the truck’s specifications. The Nissan Armada is a Nissan Patrol, only rebadged and re-tested for compliance in the United States market. It’s a big, comfy, V8, body-on-frame SUV, which shouldn’t really be particularly exciting. This is the kind of vehicle you get from General Motors with their Suburbans and Sierras and Blazers. Wait, not the Blazer. RIP the Blazer. What makes the Armada/Patrol different is that even after its 2011 softification, it has been the darling of the international desert racing community, with extremely beefy off road gear available from the factory and ultra mega super beefy off road gear available from the aftermarket. I know this because I once got a ride in a Nissan Patrol tuned by desert racing shop Mebar Auto in Dubai. It was like our Armada in every way, with the cushy leather interior and everything, only it had skid plates front and rear, super strong Method wheels, beefy tires, massive remote reservoir shocks, and a six-speed manual transmission. Over the crests of a power line service road/ATV trail, the thing flew. It was at that moment I fell in love, and I have spent the rest of my time dreaming that Nissan would one day bring their Land Cruiser rival stateside. Yes, [the Armada] shares a rugged body-on-frame chassis and powertrain with what the rest of the world calls the Nissan Patrol, and it’s built alongside that vehicle in the Kyushu factory in Japan. But most of the really good off-road equipment has been left off the menu. You can’t get locking front and rear differentials, you can’t get the trick sway bar disconnects for extra wheel articulation, and you are stuck with a suspension tune that caters to American on-road preferences. And you can’t get the Hydraulic Body Motion Control (HBMC) suspension system that links the four corners hydraulically, which reduces roll on-road and reduces harshness off. That’s on option on the Patrol, but it’s not in the cards for the Armada. But that doesn’t matter, because now that this basic Armada chassis has been federalized and made legal in the United States. That’s the break we’ve needed. Beyond this car’s weak showroom spec, the aftermarket can pick up all the slack. Now, this is something that has never happened with this SUV’s chassis-mate the Infiniti QX8000, probably because that whale has a starting price and image outside the scope of most American off road people. The Armada, starting at around $45,000, could change that. I love Nissan sometimes. It doubtlessly offers the most boring cars on sale in the United States today, but oddly it also occasionally sells some of the most interesting vehicles we get here, too. And now it adds the Nissan Armada to that list. What a strange, weird company.